The theme of the first 2014 Goodwood Breakfast Club event – supercar sunday. Featuring the ultimate high-performance machines, cars and bikes to create the greatest free supercarshow on the planet! With an eclectic mix of machinery and a delicious organic breakfast menu guaranteed for every event, there is something to entertain motoring enthusiasts, whatever your taste. The Goodwood Breakfast Club website has regular updates on each monthly theme, and for 2014 visitors must pre-register online at (www.goodwood.com/breakfastclub) to have a chance of their theme-relevant vehicle being displayed on the circuit. 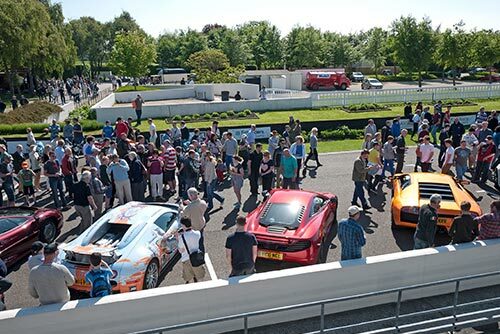 All 2014 Goodwood Breakfast Club events will be staged from 0800-1200 hours on the first Sunday of the month (except in July and September due to the proximity to the Goodwood Festival of Speed and Revival motor sport events).